The City of London unveiled a new version of its iconic red doubledecker bus today, replacing the Routemasters everyone knows and loves. Which was a little surprising, as we thought Transit London had already selected the ever-so-British team of Norman Foster and Aston Martin 17 months ago. But apparently that was just an ideas competition while this, as the video above shows, is the real deal. Set to hit the road by 2012—just in time for the Olympics, no less—the new buses are the work of Thomas Heatherwick and Wrightbus. In addition to being super sleek, the new buses are super sustainable hybrids. Get on board after the jump. With all the notice being paid to the new U.S. embassy this week, an even bigger (physically if not psychically) project just next door was overshadowed as it won a key approval yesterday. Rafael Viñoly's massive Battersea development, which will turn the iconic Battersea Power Station and 40 surrounding acres (once on the cover of a Pink Floyd album) into a huge mixed-use community, won approval from the Commission for Architecture and the Built Environment. According to our colleagues at BD, the CABE found the 5.5 billion pound project to be "intelligent and well-resolved." It includes more than 3,700 apartment units, 1.5 million feet of office space, 500,000 of retail, and community facilities, though an ecodome and other expensive features have been ditched on account of the bad economy. It wasn't all good news for Viñoly this week, though, as his similarly post-industrial New Domino project in Williamsburg, Brooklyn, took a lashing from the local community board. We'll have a full report on that when there's a final vote next month. Take a Whiff of This! But please, only in moderation. Inhaling too deeply at a new London bar may leave you, well….drunk. 2 Ganton Street, once an unused storefront, has reopened as a self-contained, walk-in gin and tonic. 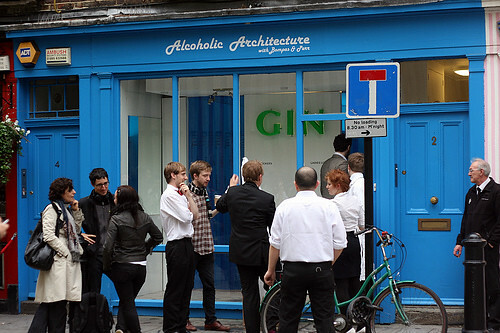 Imbibers at Alcoholic Architecture simply slip into provided plastic jumpsuits, breathe, and enjoy the buzz. The creators of the bar, Bompas and Parr, have effectively revolutionized the bar experience by removing the traditional, and oh so painstakingly boring, order and sip protocol. Self-proclaimed as operating “in the space between food and architecture,” Bompas and Parr are allowing lucky ticket holders, the event is now sold out, up to 40 booze breathing minutes in the space. Alcoholic Architecture is continuously filled with a steady mist of both gin and tonic by industrial strength humidifiers engineered by JS Humidifiers. And of course the drink is served with a twist: The crucial hint of lime comes in the form of a small green light. All safety concerns have been taken into account and there is an ambulance on standby, just in case. Don’t worry about work the next day either; so far the only reported hangover has been overly greasy hair and ringing ears from the booming music. Bompas & Par have previously gained notoriety for their artistic endeavors into the world of jelly. As they see it, “jelly is the perfect site for an examination of food and architecture due to its uniquely plastic form and the historic role it has played in exploring notions of taste.” You can check out more of their work here. Architects don’t have a great track record designing vehicles that make it to the marketplace. LeCorbusier, Gropius, Zaha, and, of course, Buckminster Fuller have all tried "streamlining" their buildings and putting wheels on them but their efforts never made it past the prototype stage. Now you can add Future Systems to the list of those who have tried and failed. 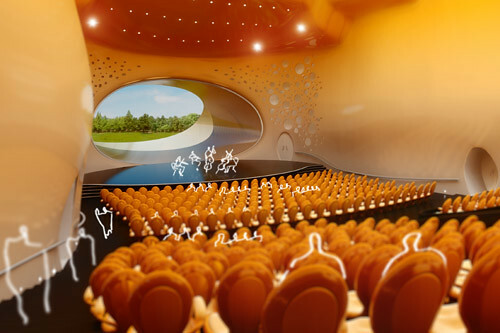 Last month, we featured the winning entry from Lord Norman Foster and Capoco Design, as well as some of the runners up. Given that there were over 700 entries, some never caught the attention of the wider public, even if they should have. Case in point: Future Systems' out-of-this-world proposal. More UFO than bus, it turned up today on BD. And while Transport for London might not have liked FS's design, it certainly is exemplary of their other blobtacular work. Maybe London's loss can be New York's gain: Start petitioning City Sights immediately. Two blue chippers Aston Martin and Foster + Partners raked in a not-much-needed $38,000 (£25,000) and a first-prize award along with Capoco Design for re-jiggering London’s famous double decker bus, the Routemaster. Sharing the award with Capoco Design, who specializes in bus and truck designs, Foster went the bulbous route without going too retro-Airstream as did many of the other 700 entries into the competition put on by Transport for London. Runners-up (but no more cash prizes) included Héctor Serrano Studio from the UK, Miñarro García, Javier Esteban from Spain, and Jamie Martin, from London. Of the Aston Martin/Foster design, Judges said they “particularly liked the overall styling package, especially the rear end” and such throwback detailing as wood flooring; LED ads and solar panels on the roof add a little more latter-day relevancy. A prototype is due by 2011. In a rare east/west AN meet-up, our California editor, Sam Lubell, was in New York last night for a launch for his new book London 2000+. 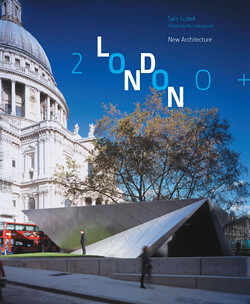 The book, from the Monacelli Press, surveys recent architecture in the British capital, from well-known works like Foster + Partner’s “Gherkin” to the Gazzano House by Amin Taha Architects. Sam gave a quick overview of the projects, which together show a city where historic buildings and contemporary design sit side by side quite comfortably. On Monday, November 17 at 6:00 pm, he will be reading from the book at the Harvard COOP Bookstore, 1400 Massachusetts Avenue in Cambridge. Cheerio, Sam!